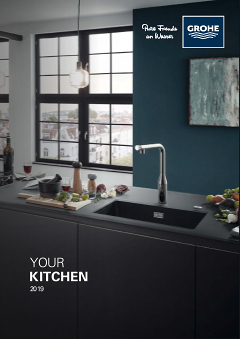 Loved by amateur chefs and professionals alike, the GROHE K7 kitchen tap makes light work of your kitchen chores. Its high spout is ideal for filling or cleaning even your tallest pots and with its convenient 140° swivel range several pots can easily be filled in succession. Crafted with the GROHE SilkMove technology, water volume and temperature control are continuously variable. Its adjustable flow rate limiter is another convenient extra, keeping your water consumption low even when the tap is used frequently. Crafted in scratch resistant GROHE SuperSteel, it has a mat stainless steel look that adds instant design appeal to any kitchen. GROHE K7 – a perfect blend of performance and design.